SpaceX's spectacular Falcon Heavy launch last month — which saw the most powerful rocket currently in operation lift off for the first time from Florida's Kennedy Space Center, with a Tesla Roadster on board — is just one herald of the new era of space exploration, argues the author of a new book. 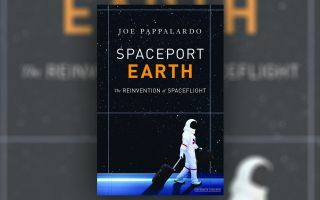 Joe Pappalardo, author of the book "Spaceport Earth: The Reinvention of Spaceflight" (The Overlook Press, 2018), stood on Florida's coast to watch the launch Feb. 6 along with an estimated crowd of 100,000 people. He told Space.com that the launch was one of the most memorable ones he attended. When NASA's space shuttle program retired in 2011, astronaut launches to the International Space Station moved exclusively to Baikonur, Kazakhstan. NASA's commercial crew program was in the works, but no spacecraft was ready to take Americans aloft from U.S. soil. To some observers, this era represented a loss of prestige — a time when the U.S. had to step back and let other countries take the lead on spaceflight. Pappalardo argues that was never the case. It's easy to say now in 2018, with both SpaceX and Boeing perhaps a year or two from launching astronauts themselves. But over the past few years, Pappalardo embarked on a journey across America — and to select launchpads around the world — to chronicle how commercial players are turning spaceflight into an even more exciting enterprise. Pappalardo's odyssey included a stop at Spaceport America near Mojave, New Mexico, in 2017, from where Virgin Galactic aims to bring tourists into space at a reasonable cost. In the book, Pappalardo noted that Virgin's first flight in space was stalled by technological hurdles and a fatal test flight on Oct. 31, 2014. But he also emphasized the important role Virgin played in spurring the spaceport's development. "Mojave is a great incubator for innovation," Pappalardo said in the interview. A selection of other stops in the book include Vandenberg Air Force Base in California, where Pappalardo saw a Minuteman III missile launch; Texas State Technical College, where a dedicated team hopes to build a spaceport; Van Horn, Texas, where the private company Blue Origin tests its New Shepard spacecraft; and Kourou, French Guiana, where French Ariane 5 rockets regularly launch satellites. At times, Pappalardo's book drifts from a chronicle of commercial space history to a simple travelogue of his adventures and the people he met. But the thrust of the book remains clear; it shows that the United States did not stop innovating after the space shuttle program ended. Nowhere is this clearer than near Titusville, Florida, where SpaceX's recent launch saw crowds approaching the size of those who saw the last shuttles fly in 2010 and 2011. "A sea change happened," Pappalardo said. "To really understand it, you need to roll back the clock to the end of the shuttle and see how the area transformed after SpaceX," he added. Pappalardo said that his main challenge in covering the emergence of commercial spaceflight is not having the benefit of hindsight. The benefit, however, is getting to talk to all the people affected by it, in real time — talking to people ranging from county officials, to farmers, to the high-paid executives running the companies. He added that he is excited to see crewed commercial spaceflight, which he called the next step in the developments he chronicled. "I'll take a good look at that," Pappalardo said of his future journalistic coverage.